Printable Telling Time worksheets in three levels of difficulty for children who are in first grade through second grade level. I recommend reviewing how to tell time with the child if you have not yet done so. 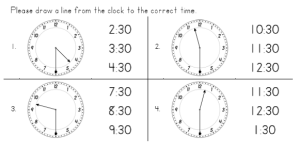 Use either a real clock that is made so that time is easily changed or a printable clock face and hands. 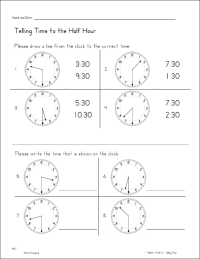 The telling time worksheets follow the same format with multiple choice answers at the top and writing the time at the bottom. Each part has 4 clocks. The files, each one is a PDF. Read about the levels of difficulty below. The Answer Sheet- The answers to all of the files that have the header "Telling Time to the Half Hour"
Difficulty levels of the groups of worksheets are based on the multiple choice answers. Today I added my new site design to most of donnayoung.org. The new design features: -Cleaner layout with less clutter;-Log-in/Log-out for members-- additionally, subscribers will no longer see the left sidebar or the adsense ads at my main website. Video of a Monarch Butterfly Emerging - The videos have been broken for a while, and now they are working. MM Medium - Handwriting lessons with a rule size of approximately 1/2". This page is new and contains 80 handwriting lessons - 2 lessons per printed sheet.